Catherine Lafferty is of Dene descent and a council member of the Yellowknives Dene First Nation in the Northwest Territories. She is currently working on a memoir entitled Northern Wildflower that documents her experiences growing up as an Indigenous woman in the North. She currently lives in Yellowknife. The North is changing now more than ever. It is apparent in our inconsistent weather patterns, the onslaught of uncontrollable wildfires, low water levels and unmanageable invasive species entering our ecosystems. These are only a few of the issues that most impact the Indigenous people of the North. Dene National Chief Bill Erasmus provided this humbling Indigenous truth on climate change: “The land will take care of itself; if it is being abused it will fight back. The question is whether we as a civilization will continue.” These words carry such a sense of impending doom, yet the reality weighs heavily all around us because that is exactly what our Earth is doing, fighting back. Traplines and hunting grounds are affected by unpredictable weather. Many plants and animals that once provided the Indigenous people of the North with nourishment are now considered unsafe or in decline because of irresponsible development. Since we can no longer survive solely on our traditional ways of life, many remote northern residents must rely on barges to supply costly processed food, but the barges are becoming less and less reliable due to increasingly low water levels. This combination of limited traditional food ways and costly processed food has significantly impacted and drastically diminished northern Indigenous culture and lifeways in a short amount of time. Chief Erasmus says, “We are the most vulnerable because we are the closest to the land,” and who would know this better than the Indigenous people of the North with our rich connection to the Earth. But with the unnerving reality of our changing environment, we can’t help but think about what the generations after us will be left with, and our hearts break as we worry that our grandchildren will never know what it is like to be able to drink a handful of pristine water straight from the lake. “For as long as the sun shines, the rivers flow and the grass grows,” is referenced often among the Indigenous leaders of the North when discussing climate change and development. Alexander Morris, one of Canada’s federal treaty commissioners, used similar words in the 1870s to describe the promise of the signed treaties. But just how long will the rivers flow? Just how long until pollution overshadows the sun? How long until the grass fades? How long until we take serious action on finding solutions to climate change? For as long as the sun shines, the rivers flow and the grass grows. Chief Erasmus is right in saying that there is a chance to turn climate change around, but only if Canada takes the lead and develops an enforced energy plan with all provinces, territories and Indigenous Nations — one that stabilizes economies and moves from non-renewables to more sustainable methods of energy. The sad truth is that the world is still very much based on profit-driven non-renewables. However, Chief Erasmus provides room for hope when he says, “the federal government is working on an energy plan and is prepared to do something about climate change that is long-lasting and effective.” This is good news, but scientists and government officials have a long way to go in finding respectful ways to build strong working relationships with Indigenous groups; relationships that are based on trust. 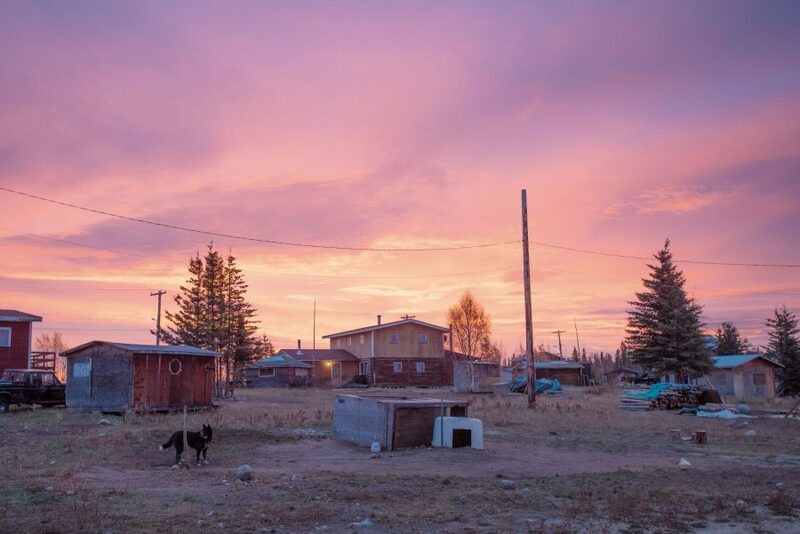 Sunrise in the small community of Gamèti, N.W.T. As respected Elder François Paulette says, “Reconciliation is meaningless unless we are reconciling with Mother Earth and Indigenous people together. This is done by undoing and restoring the damage that has been done to Mother Earth. Man can’t continue to delude themselves of what harm they are doing to the future of their children.” Paulette is referring to a revolutionary shift in the way people live their lives. “The way that most people live is harming Indigenous cultures and people need to start embracing a life that is balanced with nature.” Local hunters, gatherers and Elders like Paulette are the carriers of countless years of collective knowledge passed down to them from their ancestors. Our Elders and land users can describe intricate and fundamental details concerning the past, present and future of the land and water. Yet only in recent years has this knowledge been recognized and respected. Traditional knowledge is finally being accepted as a theoretical right and protected by law, and yet this valuable information is not being taken advantage of to benefit all people and Mother Earth. Water is our most precious resource. The rivers and the creeks are the veins and the bloodline of Mother Earth. Without water we can’t survive, which is why we must protect our northern waters at all costs. The recently signed Mackenzie River Basin Transboundary Waters Master Agreement recognizes the value of traditional and local knowledge, but as Chief Erasmus says, “Agreements such as this require constant enforcement or they will not be implemented. The North is largely affected by contaminated waters because we are downstream.” This is a clear message of the important role that the Indigenous people of the North have as gatekeepers. So, where do we go from here? It is in Indigenous laws and traditions to respect our Elders and learn from their teachings, which is why we must start by listening and heeding their advice. Only then can we begin to heal the land.